Extraordinary and expert NSF to PDF converter tool to convert Lotus to PDF exclusively for your Notes to PDF conversion requirement! 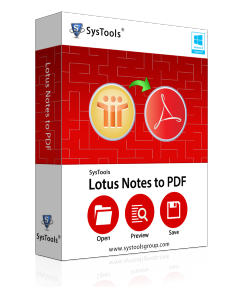 Convert Lotus to PDF: The system bounded nature of Lotus Notes email application withstands the transfer of emails from one place to another. Now, if a lawyer, or an advocate, or a forensic investigator needs to take the emails contents along with him to review the details of that email for his case, then this system specific nature of Lotus Notes keep an annoying restriction on it. In such a scenario, the NSF to PDF converter that we provide helps you to convert NSF to PDF, thereby, helping to take the emails along with you in PDF format. Significant to Note: It is mandatory for you to install Lotus Notes email application in the machine where Notes to PDF conversion is to be performed using our Lotus Notes to PDF Converter software. Check the Process to Add Notes to PDF FREE of Cost: Not every product that you go to buy comes with a FREE demonstration model, but, Lotus Notes to PDF Converter is here available in a free testing model, where you get to see the functionality of the tool by converting 10 emails per folder of Lotus Notes mailbox into PDF. Software works with almost every Lotus Notes version (8.0, 7.0, 6.5, 5.0) and with almost every Windows version (Windows 7, Vista, XP, 98, Me, 2000, 2003). Software Model with Full Functionality for Complete Conversion: This is the software model that helps you to completely convert any number of NSF emails from Lotus Notes to PDF format. This will be a great solution for you as it imparts high performance for conversion.